For a couple of years now, I’ve been aware of Jay Brickell, a lad in the year above me who shares a similar interest in media, photography, and video. 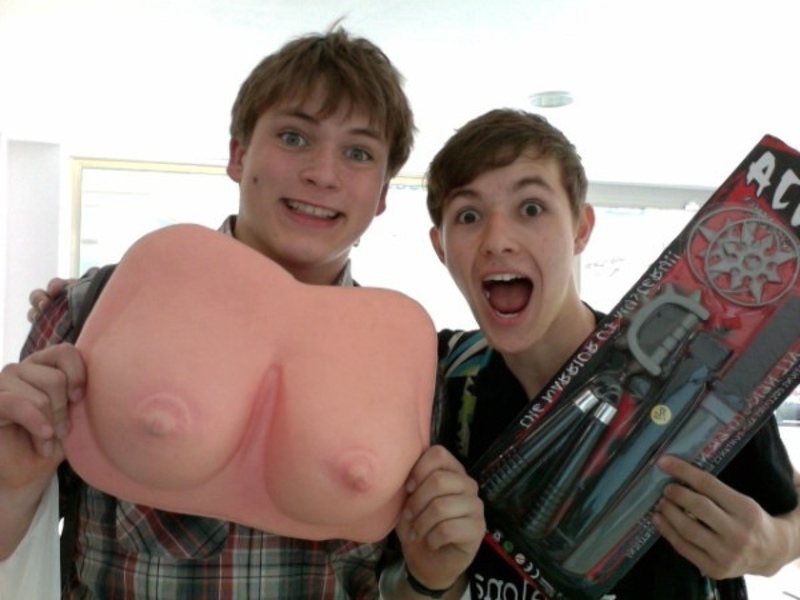 My relationship with him was strengthened enormously during Taplow Youth Choir’s trip to Catalonia in the Easter holidays (he’s the guy with whom I posed with the comedy breasts). He’s actually currently revising for his Media Studies GCSE, and – as coursework for it – made this video last summer. I’d actually not seen that film until yesterday, when, during a moment of procrastination, I checked out his YouTube channel (JaymondB). There’s some nice stuff on there, and some of the angles he’s experimented with on his mountain-boarding video are really good. However, back to his coursework piece (a trailer for his fictional film ‘Personal‘), I loved the editing on it. OK, the technical quality’s not great, and the voiceover sounds like it was recorded with a finger over the microphone, but given the equipment he had available to him – and the limited time constraint he had to work in – it’s a great piece. That said, as the video-blog below shows, the acting towards the end petered somewhat.